All eyes were locked on Lot 9 in a packed salesroom at Christie's auction house in New York during 19 minutes of feverish bidding Wednesday night. 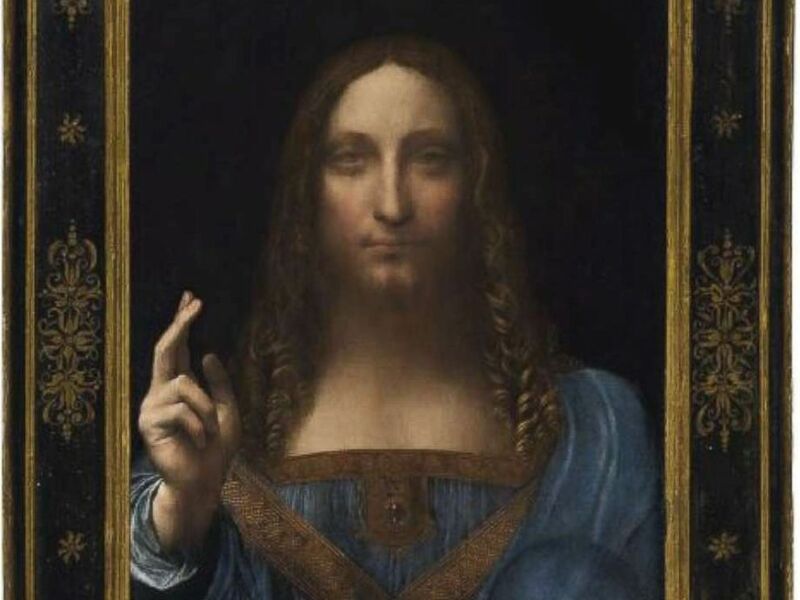 But it was an anonymous bidder who called in to secure the haunting painting depicting Christ, believed to be the work of Leonardo da Vinci, for a cool $450.3 million. 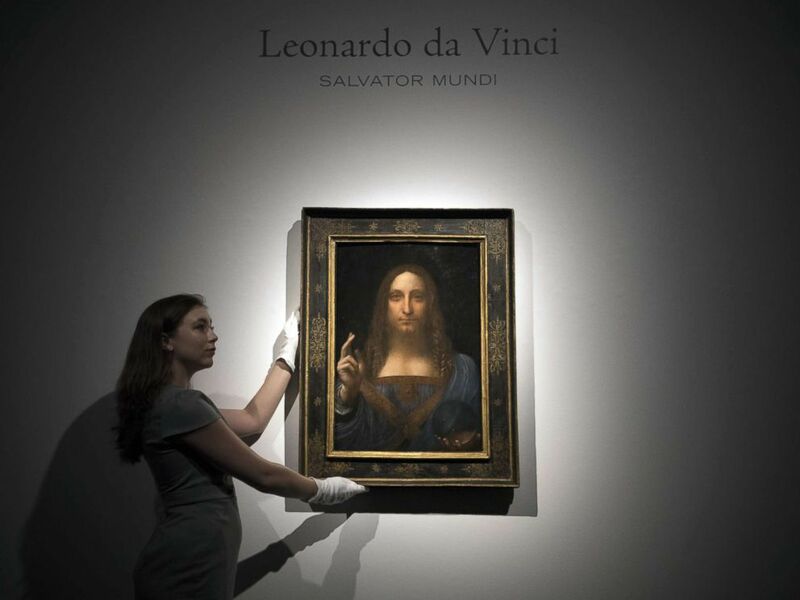 The winning bid for the piece, titled "Salvator Mundi" ("Savior of the World"), was four times Christie's pre-sale estimate and smashed the world record for the most expensive painting ever sold at auction. The sale far surpassed previous world records, including Pablo Picasso's "Women of Algiers" that fetched $179.4 million at Christie's in New York in May 2015. Christie's told ABC News the seller behind the painting was anonymous. According to The New York Times, the piece was sold by the family trust of Russian billionaire collector Dmitry Rybolovlev, who reportedly purchased it in May 2013 for $127.5 million. Auctioneer and Global President Jussi Pylkkanen is selling Leonardo da Vinci's Salvator Mundi (Savior of the World) painting for $450,312,500 at Christie's, Nov. 15, 2017, in New York City. The 500-year-old oil on panel depicts Jesus Christ dressed in flowing robes and holding a crystal orb in his left hand. Billed by Christie's as "the last da Vinci," it's the only known painting by the Italian Renaissance artist still in a private collection. It's said to be one of just several paintings from Leonardo's own hand that still exist. 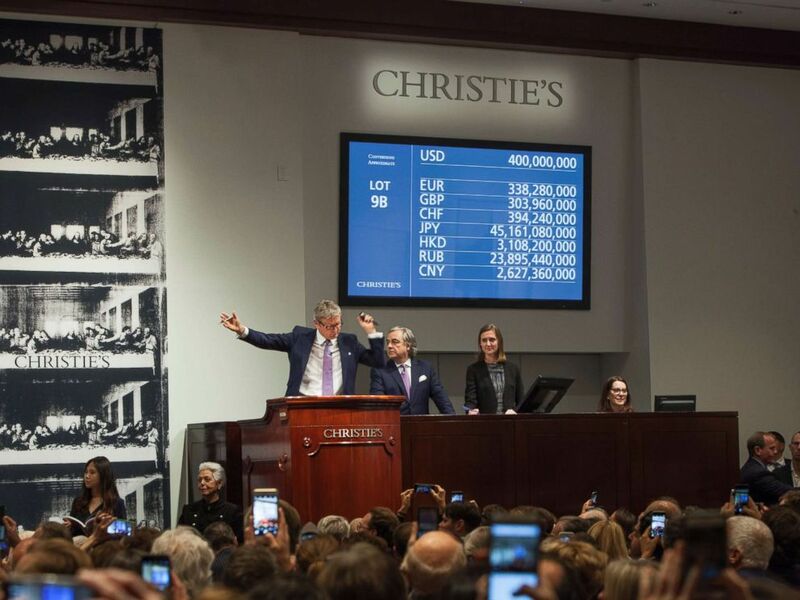 Loic Gouzer, the chairman of Christie's postwar and contemporary art department, said the work of art attracted crowds of people while on exhibition in Hong Kong, San Francisco, London and New York in the weeks leading up to Wednesday's auction. "We toured Leonardo da Vinci’s Salvator Mundi around the world, and at every stop crowds of people were drawn to this painting, wanting to stand in front of the picture and experience it in person," Gouzer said after the sale. "Even for me, it is very difficult to pinpoint what it is that makes this painting so poignant, you cannot comprehend the mystery of Leonardo. That is the magic of his work." A staff member poses with a painting by Leonardo da Vinci entitled 'Salvator Mundi' in London on OCt. 24, 2017, before it is auctioned in New York. The painting is the last privately owned Da Vinci and is expected to fetch around $100,000,000. Leonardo painted "Salvator Mundi" around the same time as the "Mona Lisa," and the two works of art "bear a patent compositional likeness," Gouzer said. "Leonardo was an unparalleled creative force and a master of the enigmatic. Standing in front of his paintings, it becomes impossible for one's mind to fully unravel or comprehend the mystery radiating from them — both the 'Mona Lisa' and 'Salvator Mundi' are perfect examples of this. No one will ever be able to fully grasp the wonder of Leonardo's paintings, just as no one will ever be able to fully know the origins of the universe," he added. Leonardo da Vinci’s "Salvator Mundi" painting. The provenance of "Salvator Mundi" is largely shrouded in mystery, however. According to Christie's, the painting once belonged to King Charles I of England in the mid-1600s. It was recorded at a 1763 sale and then vanished until 1900, when it was acquired by Sir Charles Robinson, an art collector. By this time, Christ's face and hair had been painted over and the painting's authorship and illustrious royal history had been forgotten. The painting was consigned to a sale at Sotheby's auction house in 1958 where it fetched just 45 British pounds. The artwork disappeared once again for almost 50 years, leaving many scholars to believe it had been destroyed, until it resurfaced in 2005 when it was purchased at an American estate sale. "Salvator Mundi" was attributed to Leonardo after six years of restoration and research, becoming the first discovery of a painting by the Renaissance master since 1909, according to Christie's. It was dubbed "the greatest artistic rediscovery of the 21st century." Dianne Dwyer Modestini, the conservator who started restoring the piece in 2007, recalled the moment she first realized the painting was by Leonardo himself. "My hands were shaking," Modestini said in a statement released through Christie's in October. "I went home and didn’t know if I was crazy." 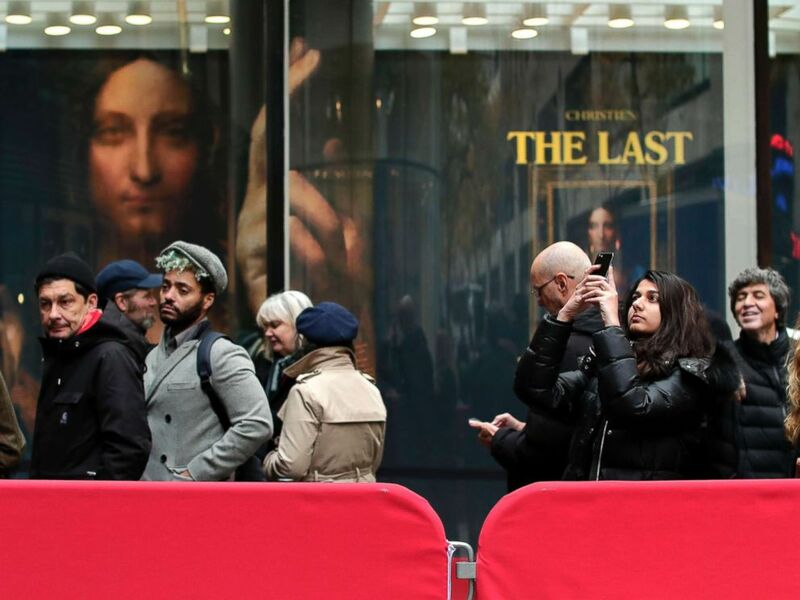 Visitors wait outside Christie's to view Leonardo da Vinci's "Salvator Mundi", Nov. 14, 2017, in New York. The painting is expected to sell at auction for $100 million on Wednesday. Francois de Poortere, head of Christie's old master paintings department, said the painting has been referred to as the "Male Mona Lisa." "After centuries of hiding, da Vinci’s Christ as 'Salvator Mundi' stirred unmatched sensation in the art world when it was unveiled on the walls of London’s National Gallery in 2011," he said. Prior to Wednesday's highly anticipated sale, Christie's had secured a guaranteed bid for the painting of at least $100 million by an anonymous investor. Christie's senior specialist Alan Wintermute said witnessing the "masterpiece" appear at auction is "as close as I've come to an art world miracle." "'Salvator Mundi' is the Holy Grail of old master paintings. Long known to have existed, and long sought after, it seemed just a tantalizingly unobtainable dream until now," Wintermute said. "It has been more than a century since the last such painting turned up and this opportunity will not come again in our lifetime."